Completely updated 3BR 2Bath RANCH nestled @Briarchase Estates, Lake St. Louis. This beautiful, feels-brand-new home boasts vaulted ceilings, bay window w/WO & wide open floor plan in this meticulously maintained home. Beautiful brand new hardwood 6" handscraped planks throughout entry foyer, great room, large charming eat-in kitchen & spacious master suite. Upgraded maple cabinets, counters & archtop window in kitchen. Clean, fresh & sparkling everywhere; new paint throughout; new carpet @support BRs; beautiful new ceiling fans & light fixtures! 2" faux wood blinds. Large corner lot w/ prof landscape; colored & stamped free-form patio; fully wood-fenced backyard for privacy & extra safety. Huge basement w/ full bath rough-in for future expansion & an already framed space too! 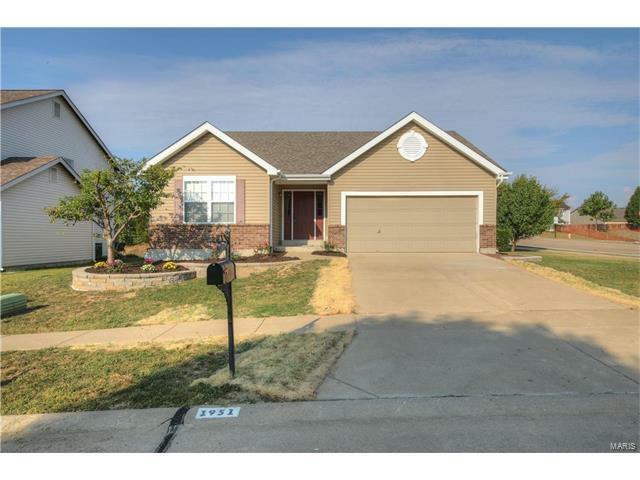 Wonderful family orientated neighborhood w/ a pond, walking trails, pocket parks & athletic courts; in coveted Wentzville's AAA-rated school district. OH!..The 2-car deluxe garage door "glides like butter!"